O-Cedar, Twist & Shout, Bona and Swiffer still rise to the top in our report on mops. New for 2018? The iRobot Braava mopping robot. Whether you need a mop for serious scrubbing, or just want to push a button and let the machine do the job, we have a recommendation for you. The inexpensive O-Cedar Microfiber Cloth Mop is a cut above the rest because of its superior absorbency and washable, tangle-resistant mop heads. Users also like its telescoping handle. The O-Cedar is versatile enough to be used with or without a wringer bucket, and we recommend pairing it with the O-Cedar Quick Wring Bucket (Est. $9). However, some say it's easier to control moisture levels by wringing it out by hand. The Twist & Shout checks all the major boxes for a spin mop: It's easy to wring out the microfiber mop head, it maneuvers well into corners and under furniture, and it does a great job of cleaning floors without leaving them too wet. There are also no flimsy pedals to break - just push the mop handle down into the bucket to activate the wringer. The handle adjusts up to 56 inches. The Bona Hardwood Floor Care System is a good one-stop shop for buyers nervous that overly wet mops or harsh cleaners could damage their wood floors. It pairs a microfiber mop with a gentle, non-streaking cleaner, and enthusiastic users say both keep their floors clean, shiny, and free of annoying residue. The included dusting and cleaning mop pads are also washable, cutting down on waste and continuing costs. A longtime favorite among spray-mop users, the Swiffer WetJet remains one of the best on the market for everyday touchups. The cleaning dispenser bottles and disposable cleaning pads are easy to attach and detach, but they also do an excellent job of getting rid of dirt, grime and pet hair. Reviewers say the WetJet cleaning solution smells nice and dries very quickly, meaning they don't have to tiptoe around a wet floor for too long. Why mop at all if you can get a machine to do it for you? 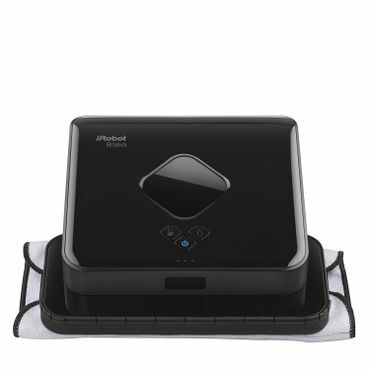 The iRobot Braava 380t Robot Mop is quiet, efficient and very easy to use. The included NorthStar navigation cube helps the Braava navigate around your floor plan, and when it's done it returns to where it started, giving of a soft musical tone to let you know it's finished. It also sweeps, and everything you need to get started is included. A good floor mop will be your best friend when it comes to keeping your floors clean. The best mops are easy to push, are maneuverable enough to get into corners and under cupboards, and won't buckle under when you need to lean in and use a bit of muscle to scrub. The one feature a floor mop really needs (with the exception of spray mops or mops for hardwood floors, which don't get as wet) is an effective way to wring out the mop head. Otherwise, the mop will be heavy and excess water will pool on the floor. All of the floor mops and spin mops in this report have some type of integral wringer, or can be paired with a wringer bucket. Before you can wet mop, start with a dry cleaning to remove bigger debris. That means either sweeping with a broom, dusting with a dust mop, or using a good vacuum cleaner designed for hard floors. We cover vacuums in separate reports on upright vacuums, canister vacuums, stick vacuums and robotic vacuums. Also, if you really need a deep cleaning, we recommend some steam mops for that task as well. Floor mops have either microfiber strings or strips, or a sponge for cleaning and absorbing spills. They can be used with a bucket, or you can just wet them in the sink, wring and mop. Some have systems for wringing, while others need to be wrung out manually, or you can use a bucket with a wringer. Owners like that these mops can be used with any cleaning solution they choose. Fans of the O-Cedar Microfiber Cloth Mop (Est. 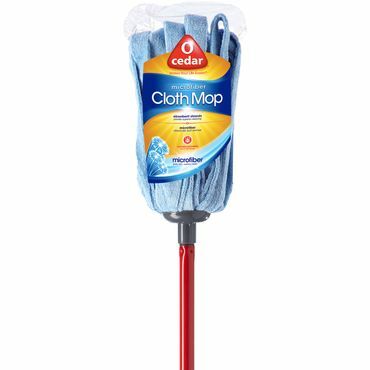 $20) say this mop is the one to beat for absorbency and ease of use, especially when they pair it with the equally well-reviewed O-Cedar Quick Wring Bucket (Est. $9). Users say the mop head soaks up messes effectively and does an excellent job of cleaning floors without leaving streaks. The bucket is easy to use with this floor mop. Just put the mop head into the wringer and push down; the wringer collapses around the mop head, squeezing out excess liquid. It's not as efficient as heavier, traditional wringers, but is great for casual home use. Plenty of people also use the O-Cedar Microfiber Cloth Mop without the bucket, wringing it out manually. Most say that's easy to do, and some prefer it, saying that bucket wringers are flimsy or they like to control how much moisture to leave in the mop head. One tip: Wearing rubber gloves may make manual wringing easier. The mop head on the O-Cedar is washable, and uses the O-Cedar Microfiber Cloth Mop Refill (Est. $30 for 4). Testers with Wirecutter particularly like that the microfiber fabric is looped, which prevents tangles during use. They also praise the extendable handle, but several reviewers report issues getting it to extend properly and stay locked during use, and generally say that the handle feels flimsy. Otherwise, most love their O-Cedar mop and say they can't believe how much cleaner it gets their floors compared with other mops they have owned. One note on the price of the O-Cedar Microfiber mop: It's about twice the retail price at Amazon. The manufacturer explained that the higher price is due to the fact that shipping is free via Prime, whereas other retailers charge for shipping -- with those shipping costs sometimes more than doubling the price of the mop (which is true, we found a shipping charge of $14 at one online source; some won't ship it at all). If you can find it in your local Target, Walmart, Home Depot, Lowe's or Ace Hardware, you'll only pay around $10 for the mop. The Libman Wonder Mop (Est. $9) gets high marks for a floor mop that's also very affordable. It's long been a favorite mop of users, and it still earns a top spot in our roundup. Reviewers praise the Wonder Mop for its microfiber strips, which are lightweight and less susceptible to mildew than standard cotton string mops (which we don't recommend for this reason and because they're not as effective as newer microfiber mops). Testers with Wirecutter say the metal handle is "strong, light and nimble," and users say they can bear down to scrub stubborn stains without the head folding over, or feeling as if the handle is going to bend or break. However, a few say it does not scrub well enough to deep clean tile that has visible grout, such as some ceramic tile floors, and others complain the mop head is a bit small. The Libman Wonder Mop has an integrated wringer sleeve so you can wring out excess water without having to touch the mop head or use a separate wringer or bucket. As Wirecutter notes, that makes it particularly ideal for smaller spaces. Most users say the wringer is easy to use, although some say it can be tricky to get the hang of at first. The mop is very easy to maneuver and can get into tight corners and tough spots like the sides of toilets. Like all string mops, the Wonder Mop is great for absorbing liquid spills. The mop heads, the Libman Wonder Mop Refill (Est. $13 for 2), hold up for about 50 trips through the washer. While most people seem to prefer a microfiber mop such as the O-Cedar and Libman mops for heavy-duty cleaning, a basic sponge mop may still be on your list because it's not as cumbersome for quick jobs. If so, the Rubbermaid RCPG780 PVA Sponge Mop (Est. $20) is among the best-rated sponge mops out there. Though pricier than other sponge mops, reviewers say this commercial-grade option is more durable than the competition, with a sturdier handle and a PVA (polyvinyl alcohol) mop head that stands up to heavy-duty scrubbing. This Rubbermaid sponge mop uses the Rubbermaid Commercial Products FGG78112 Refill (Est. $10). Reviewers caution that these PVA mop heads must be thoroughly soaked before use so that they don't tear, a step that some owners do find annoying. Some others also say the mop's telescoping handle sometimes won't stay put once lengthened, a common complaint that plagues many mops. Spin mops are regular floor mops that include a system for wringing out excess water. This is usually a bucket with a wringer that is operated either by a foot pedal or by placing the mop in the wringer, causing it to spin. Some actually squeeze and wring the mop out, while others just use centrifugal force to spin the mop dry. Spin mop heads are round and the strings or strips are made from lightweight, absorbent materials. Thanks to a swiveling head and lay-flat handle, they maneuver well, even in narrow spaces. They can be used with any type of floor cleaner. 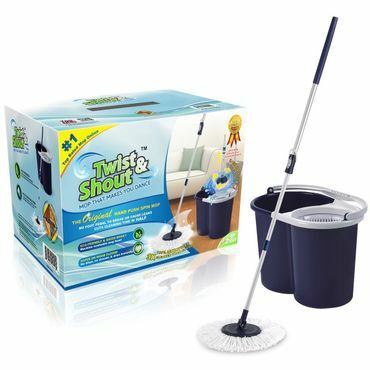 The spin mop that gets some of the best overall reviews from owners is the Twist & Shout (Est. $50). It receives very high feedback for its great performance on a variety of floor types, and for the ability of the handle to lay flat to reach under furniture and cabinets and the mop head to rotate to reach into tight corners. It excels in absorbing spills, even large ones. Where the Twist & Shout really shines is in its wringer technology. Most spin mop bucket systems have a foot-operated pedal that you have to push down to get the wringer to spin. However, this system can still leave the mop head quite wet, and foot pedals get poor reviews for long-term durability. The Twist & Shout, on the other hand, has the spin action integrated into the wringer itself. You just lock the mop handle, stick it in the wringer and it twists and spins to wring out the excess water. Reviewers say the wringer does a great job of squeezing out almost every bit of excess liquid, so the final go-over leaves floors damp, not wet, speeding the drying process. The Twist & Shout includes two microfiber mop heads that can be replaced easily with the Twist & Shout Mop Replacement Mop Head (Est. $15 for 2). The handle on the Twist & Shout can be adjusted up to 56 inches. Some users say the mop seems flimsy; however, that complaint is one we see about virtually every mop in this report. Reviewers who have had issues and had to deal with customer service rave about their experience. Another well-reviewed alternative to the Twist & Shout, the O-Cedar EasyWring Spin Mop and Bucket System (Est. $30) has attracted plenty of fans of its own. The main difference between the O-Cedar EasyWring Spin Mop and the Twist & Shout is the wringing mechanism. While you simply push down on the handle of the Twist & Shout to activate the wringer, the O-Cedar EasyWring requires you to pump a pedal on the side of the bucket. Reviewers say this works well for the most part, but it may require some trial and error to leave the mop just damp, and not overly wet. A splash guard helps keep water in the bucket instead of all over the floor. While the Twist & Shout has a traditional round microfiber mop head, the O-Cedar EasyWring uses a triangular microfiber mop head that reviewers say is great for cleaning tight corners. The O-Cedar Easy Wring Spin Mop Refill (Est. $8) can be washed up to 10 times. The mop head also pivots and, like the Twist & Shout, the handle can lie nearly flat to clean under furniture. The handle can adjust from 33 to 51 inches -- note that if you're tall, you'll get an extra 5 inches with the Twist & Shout. Again, some reviewers say the product is flimsy, and some complain that the handle doesn't stay locked during use. If you're concerned about the durability of plastic wringers found on floor mops such as the Twist & Shout and O-Cedar EasyWring, the Mopnado Walkable Spin Mop (Est. $60) features a stainless-steel wringing basket. The premium price also gets you an included scrub brush attachment, built-in soap dispenser, spin agitator and a wheeled bucket. The Mopnado's wringing mechanism is similar to the one on the Twist & Shout. Instead of using a pedal to operate the mechanism, you simply push down on the handle. But the Mopnado also has a spin agitator, meaning you actually spin the mop head on the wet side of the bucket to remove dirt and grime, and then move it to the wringer to spin it dry. Reviewers like this feature, saying it does a better job of keeping grime off their mop head, and accordingly, off their floors. Mopnado comes with two round microfiber mop heads, but refills are available as the Mopnado Spin Mop Replacement Mop Head (Est. $17 for two). Like the Twist & Shout and O-Cedar EasyWring, the mop head pivots and the handle can lie nearly flat to clean under furniture and in other tight spots. The handle extends up to 56 inches for taller users. While reviewers agree that the Mopnado is not as flimsy as other mops, some still say they've had problems with the bucket handle falling off or the wringer breaking. Hardwood floors will never go out of style, but how to properly clean them causes some confusion. Major concerns with hardwood include how to leave it spotless without using too much liquid – this can cause wood flooring to swell and crack – and finding a cleaner that won't damage the finish. Many common cleaners, even something innocuous like vinegar, can eat away at the floor's finish. For those reasons, experts recommend simple microfiber dust mops for day-to-day cleaning. Wet mops may leave too much moisture if not thoroughly wrung out, and steam mops may leave heat marks or cause warping. Buyers who want to clean their hardwood floors without causing any damage will be well-served by the Bona Hardwood Floor Care System (Est. $40), which reviewers say does a good job keeping floors shiny and clean without leaving excess moisture or a damaging, dulling residue. The system includes a mop with a detachable microfiber mopping pad and dusting pad, as well as a 32-ounce spray bottle of Bona Hardwood Floor Cleaner. 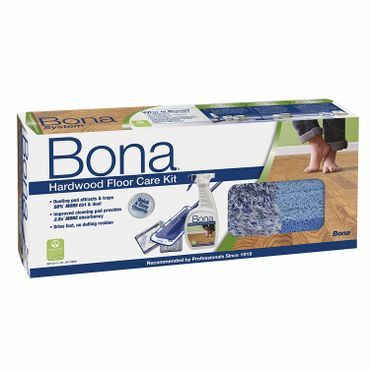 If spraying cleaner from a bottle sounds inconvenient, Bona also offers a Bona Hardwood Floor Spray Mop (Est. $45). Reviewers like the Bona mop heads because they glide easily across their floors, and they're particularly complimentary of the cleaner, which most say dries quickly and doesn't leave behind annoying streaks. Bona mop pads can be machine-washed and dried, though Bona cautions against using any dryer sheets, bleach or fabric softener while doing so. Replacements are available in the Bona 3-Piece Microfiber Pad Pack (Est. $14), which includes a dusting pad, cleaning pad and deep-clean pad meant for more heavily soiled floors. Some reviewers caution that the four-section mop handle is flimsy, sometimes disconnecting from the mop head or coming apart at connection points. If you already have a preferred hardwood-friendly cleaner and just want a sturdy mop for your hardwood flooring, the Microfiber Wholesale Professional Microfiber Mop (Est. $40) gets enthusiastic feedback from buyers who say it's worth a splurge since it's built for the long haul. The 18-inch microfiber mop pad also has a larger surface area than most other dust mops, allowing for speedier cleaning. Reviewers say what really sets this Microfiber Wholesale mop apart is higher-quality construction. It has a stainless-steel handle that can telescope from 4 to 6 feet long, and unlike many competing mops, it won't collapse in the process, most owners say. It also lies almost flat against the mop pads to clean under furniture, beds, cabinets or other dusty areas. The included wet mop and dust mop pads reportedly stay put on the mop handle and can be cleaned in the washer. A handful of owners say the mop head is too big to get into tighter spaces, however. For a cheaper alternative to both the Bona system and the Microfiber Wholesale mop, the O-Cedar Microfiber Flip Mop (Est. $20) can make quick work clearing hardwood floors of dust, pet hair or light dirt, owners say. Its mop head is a generous size – about 18 inches, like the Microfiber Wholesale mop – and reviewers love being able to flip the mop pad for twice the cleaning surface, or keep one side damp and one side dry for dual cleaning. Like most microfiber mop pads, these O-Cedar pads are machine-washable, and the manufacturer says they should withstand about 100 trips through the washer before being replaced with an O-Cedar Microfiber Flip Mop Refill (Est. $6). Though O-Cedar touts the mop pads' scrubbing strips, a handful of reviewers say the mop head is not built for heavy-duty scrubbing since it can't withstand a lot of pressure on the split pads. Some also say the mop head comes loose from the handle too easily. Spray mops aim to be the most convenient floor mop you can own. They include a container for cleaning solution that's attached to the mop handle and disposable pads that attach to the base. Just spray, mop and discard the pad when it's too dirty. There's a cost to this convenience, of course: Pads and cleaner refills can be expensive, and the mops operate on battery power, so batteries have to be replaced. Some also worry about the environmental impact of disposable accessories, although some mops have refillable containers that can use any type of cleaning solution and washable, reusable pads. Also, spray mops are just for light cleaning and will not absorb water like a traditional floor mops, so you can't use it for tasks like sopping up your child's spilled milk. The granddaddy of all spray mops, the Swiffer WetJet (Est. $25), has managed to retain its popularity over the years. Reviewers say it's extremely easy to use: When empty, the solution dispenser pops out with the push of a button, and the disposable pads have Velcro-type attachments so you don't have to bend to attach them. Just make sure the Velcro side is face up, place the mop head on the pad and push down lightly. 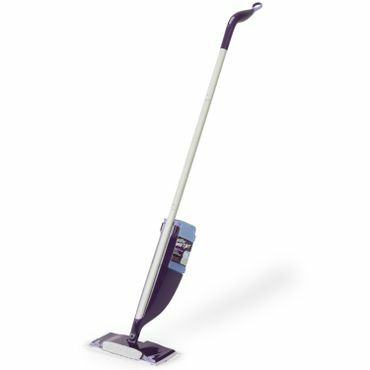 The Swiffer WetJet is best suited to cleaning daily dirt from your hard floor. It does not absorb liquid spills and doesn't pick up chunks of grime, but those who use it just for wet mopping are pleased with its performance. The textured pads pick up a lot of dirt, according to users, and you can even lean in and give a stubborn spot a good scrubbing -- although some suggest pretreating dried stains first by squirting the spot with the mop's cleaning solution and letting it sit, or using a separate cleaner to pretreat it. Many reviewers say the WetJet works well at picking up pet hair, too. The cleaning solution used with the WetJet, Swiffer WetJet Multi-Purpose Cleaner (Est. $25 for a pack of 3) gets good feedback for its effectiveness, pleasant scent and quick-drying abilities. In fact, that quick drying time, a result of both the cleaner and the Swiffer WetJet Pad Refills (Est. $12 for 20), is one of the most raved-about features of the Swiffer WetJet. Many reviewers say the first section of the floor they mop is dry before they get to the end of the job, and they love the convenience of not having to deal with a damp floor for long. While the Swiffer WetJet is convenient, it does have its detractors. The initial cost of this floor mop is low, but some complain that the cleaning solution and pad refill costs add up. And the WetJet can't be used with any cleaning solution other than its own; special tabs on the containers keep them from being reused. The Swiffer also requires four AA batteries that are not included and need to be replaced when the trigger stops working. Critics are also concerned that the cleaning solution dispensers, pads and batteries clog landfills, though in some communities the pads or containers may qualify for recycling. Those who would like the convenience of the Swiffer WetJet without the ongoing costs or environmental impact should look at the Rubbermaid Reveal Spray Mop (Est. $45). It has a higher initial cost than the Swiffer, but the microfiber pads are washable and reusable, and the included cleaning solution bottles accept any cleaner you like to use. The kit includes two bottles and three pads. Many users say they use two different solutions in the two bottles depending upon what type of floor they're cleaning. Additional pads are available as the Rubbermaid Reveal Mop Microfiber Cleaning Pad (Est. $7). The Reveal was edged out of the top spot because some reviewers say it doesn't have the overall cleaning performance or durability of the Swiffer WetJet. Although most say it cleans quite well, others say it's best for very light cleaning jobs such as homes without a lot of traffic. There are also reports of the spray trigger giving out after a short period of time. In addition, Rubbermaid gets mixed reviews for customer service, while Swiffer is reportedly more responsive to complaints. Another alternative to the Swiffer WetJet, just in case it's sold out, is the O-Cedar ProMist Microfiber Spray Mop (Est. $30). It also features a refillable bottle that can be used with any cleaning solution. While the mop comes with a washable, reusable microfiber pad, O-Cedar ProMist Disposable Refills (Est. $10 for 10) are also available; they can be washed up to five times before discarding. For the most part, reviewers are happy with the ProMist's cleaning performance, though the reusable pads' included "scrub zones" get mixed reviews for effectiveness. Most say the one-touch bottle release works well, and the trigger that releases cleaning solution is easy to squeeze. Unfortunately, several reviewers say they've had problems with cleaner leaking from the bottle, no matter how carefully they attached it. Others say the spray mechanism clogs too easily. You know what's better than mopping? Having a robot to do it for you. The bad news is that there is only one decent choice in this category. The good news is that the iRobot Braava 380t (Est. $250) is a really good mopping robot. I know that because I bought one and detailed my experiences in this blog post. There are no expert reviews of the iRobot Braava 380t, but users mostly like it. Although it gets only 3.9 stars on Amazon, a deep dive into some of the lower ratings reveals mostly complaints about it not navigating well. I agree with that, it's much better for those with fairly straightforward areas without a lot of clutter -- which describes my house perfectly. Even those who are disappointed in its navigational abilities, or feel that it's overpriced, do say it cleans very well. Personally, I've had mine for four months now, use it several times a week, and like it more every day. I know it gets the floor clean, because I've tested its performance by going over heavily traveled areas it's already mopped with a clean pad attached to my Swiffer WetJet and there was no leftover dirt. It's saved me a lot of time, because my three cats are heavy shedders and run in and out of the backyard a lot -- leaving plenty of dirt, dander and hair behind, which the Braava 380t handles very well. I do have to do some areas with my Swiffer, but since they're not heavily trafficked spots -- and it's a very small percentage of my floor -- I just give them a quick mopping once a week and it takes me just a few minutes. I would highly recommend this mopping robot. There is just one hands-on expert review of floor mops that includes testing, from Wirecutter. Accordingly, we also turned to thousands of owner reviews to evaluate mops' cleaning performance, ease of use and durability. The best site by far is Amazon, which has the largest and most detailed collection of mop reviews. We also analyzed owner feedback from Walmart and Target, which stock the most popular mops, as well as home-improvement retailers HomeDepot and Lowe's.